In Utah, title to real property can be transferred from one party to another by executing a grant deed. Use a grant deed to transfer a fee simple interest with some covenants of title. 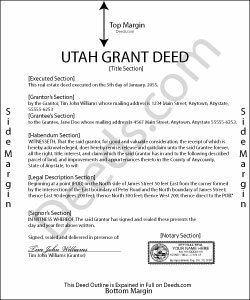 The word "grant" in the conveyancing clause typically signifies a grant deed, but it is not a statutory form in Utah. Grant deeds offer more protection for the purchaser (grantee) than quitclaim deeds, but less than warranty deeds. A grant deed differs from a quitclaim deed in that the latter offers no warranty of title, and only conveys any interest that the grantor may have in the subject estate. Grant deeds guarantee through implied covenants that the title is free of any encumbrances (except for those stated in the deed) and that the grantor holds an interest in the property and is free to convey it. A warranty deed offers more surety than a grant deed because it requires the grantor to defend against claims to the title. A lawful grant deed includes the grantor's full name, mailing address, and marital status; the consideration given for the transfer; and the grantee's full name, mailing address, marital status, and vesting. Vesting describes how the grantee holds title to the property. Generally, real property is owned in either sole ownership or in co-ownership. For Utah residential property, the primary methods for holding title are tenancy in common and joint tenancy. A conveyance of real estate to two or more unmarried persons creates a tenancy in common, unless a joint interest is declared (Utah Code 57-1-5(1)(b)). A conveyance to a married couple vests as joint tenancy with rights of survivorship, unless declared otherwise (57-1-5(1)(a)). As with any conveyance of realty, a grant deed requires a complete legal description of the parcel (57-3-105). Recite the prior deed reference to maintain a clear chain of title, and detail any restrictions associated with the property. The completed deed must be acknowledged by the grantor (and his or her spouse, if applicable) in the presence of a notary. Finally, it must meet all state and local standards for recorded documents. Record the original completed deed, along with any additional materials, at the recorder's office in the county where the property is located. Contact the same office to verify recording fees and accepted forms of payment. A water rights addendum under 57-3-109 is required for all applicable deeds. Applicable deeds include any conveyance in fee simple of title to land or any conveyance of water rights. This form must be completed and signed by the grantor and joined by the grantee to acknowledge receipt. This article is provided for informational purposes only and is not a substitute for the advice of an attorney. Contact a Utah lawyer with any questions related to the transfer of real property. Debbie G. said: Easy to use, I would recommend deeds.com. I would recommend visiting your county recorder before having document notarized. They will review document and make sure everything you need is on the deed, before having notarized. Reply from Staff: Thank you Debbie. Have a fantastic day! RAYMOND W. said: Thank you for the comprehensive forms - very much appreciated! Reply from Staff: Thank you Raymond. Kitty H. said: I have had it reviewed by a mortgage broker and a title manager and both said it was done correctly! Your product and the instructions are what made this possible. It took me several hours as I continued to review your information. I just finished printing and ready to file. Yeah! Thanks! Highly recommend the product!